Hyper Princess Pitch is a freeware game based on the 1996 DOS game Operation: Carnage (which was inspired on Smash TV, a game from 1990) and keeps the fast-paced shooting action while bringing the Garden Gnome Carnage sidekick Princess Pitch to the spotlight. The outlandish plot says that Mecha Santa plans to spread happiness and cheer all over the world and Princess Pitch wants to end those silly plans, since she didn’t get any presents when she was young. So, in danger of becoming a happier place, the world is now at the hands of Princess Pitch, who invades Santa’s base. 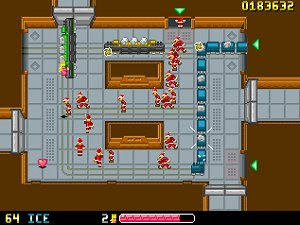 But the game is a treat with its retro style and great gameplay, an arena shooter comprised of 90 rooms to clean of robot elves and other Christmas related enemies.